John McCain & Jeff Flake say Burros are Out of Control. Arizona Fish & Game calls them "Invasives." The Facts tell a Different Story. The facts beg to differ. Burros first arrived in the Americas centuries before the USA was born. They packed along southwestern trails beginning in the late 1700s. They transported goods and firewood, and helped open new, previously inaccessible towns. They hauled prospectors’ equipment to remote mines. Some became blinded from working underground. Eventually, they were turned loose to fend for themselves. These wily, sure-footed animals adapted to the stark landscape. They became one with the desert and canyons, their mournful cries echoing at night through the wilds. They graze on lower quality forage, and dig deep water holes that benefit bighorn sheep, mule deer and other species. Although cattle and other livestock vastly outnumber wild burros on public lands, the long-eared equines are scapegoated for range degradation. 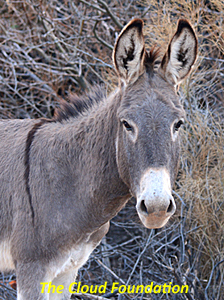 Not one validated study has demonstrated that wild burros destroy fragile habitat. The myth persists, because it suits a certain political narrative. Under the 1971 Wild Free-Roaming Horse and Burros Act ensures, wild burros and mustangs are to be protected on the lands where they roamed as “living symbols of the historic and pioneer spirit of the West” that “contribute to the diversity of life forms…and enrich the lives of the American people.” The BLM’s first count in 1974 showed an estimated 15,000 burros in the West. Today, less than 11,000 remain in government-managed herd management areas (HMAs). 1,314 captured burros are incarcerated in dismal, costly government holding corrals. The Black Mountain HMA, Arizona’s largest, contains over one million acres. In 2013 the BLM stated there were 700 wild burros in this herd area. Today, the Agency claims there are over 1500. And they want that number reduced to a population target (appropriate management level or AML) of 478, or one burro per 2000 acres. At this reported growth rate, the Black Mountain burros would be miraculously fertile. Yet the BLM has never conducted an accurate, credible census. In 2013, the National Academy of Sciences (NAS) urged the BLM to revise all its AMLs based on rigorous, up-to-date population statistics and genetic testing to assure viability of the herds. Conduct an accurate population count of HMAs based on scientific census techniques, not random flyovers. Halt the roundups. BLM helicopter “gathers” harm burros and waste taxpayer money. Post-roundup, foalings increase sharply in a biological response called “compensatory reproduction.” Keeping a burro in the wild costs nothing. Roundups cost $600 per equine, and keeping a burro in permanent holding costs $50,000. Work with advocate groups and local volunteers to stabilize herd levels using PZP, a safe, reversible, dartable fertility control vaccine that protects herd genetics. Cost per vaccine: $25 annually, or $240 for a longer-lasting, hand-injectable PZP-22 vaccine. Prevent road accidents by reducing speed limits in areas where burros cross the highway; use signage and night lighting similar to that provided for species such as elk. Designate a Black Mountain Wild Burro Range, a call recently made by The Cloud Foundation. Retiring livestock from this range and allowing the return of predators would enable natural controls on herd size. It would promote wildlife diversity and restore these desert rangelands for generations to come. Charlotte Roe is a conservationist, burro adopter, retired foreign service officer/science attaché, and a founder of the Wild Equid League, an affiliate of The Cloud Foundation.